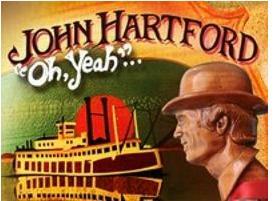 John Hartford's 30 year long career was nothing short of fascinating. He has performed with legends such as Chet Atkins. He has had his songs covered by the likes Elvis Presley and Aretha Franklin. He has been nominated for and won several Grammy Awards. He has written movie scores and written for the likes of Glen Campbell. His music has taken him across the country from St. Louis to Nashville to Los Angeles and beyond. And in "Gentle On My Mind" he penned one of the most popular songs of all time.